Below are some examples of forest-friendly forestry and some groups that I believe promote truly forest-friendly forestry in Nova Scotia. These are just some examples. I appreciate that there are many individuals, families and small groups that practice forest-friendly forestry without any fanfare. Also, it’s appropriate to think of wood products as only one category of the possible products of forestry; there are a few existing and many potential NTFPs (non-timber forest products) that can support rural economies such as maple syrup, mushrooms, ecotourism. “The Nova Scotia Woodlot Owners and Operators Association is committed to being your best source for information and advice about the sustainable management of the Acadian Forest. We do not offer silviculture or harvesting services; our interest is only in the protection and enhancement of the native forest ecosystems of Nova Scotia.” The website provides links to relevant resources. View A short history of NSWOOA.. 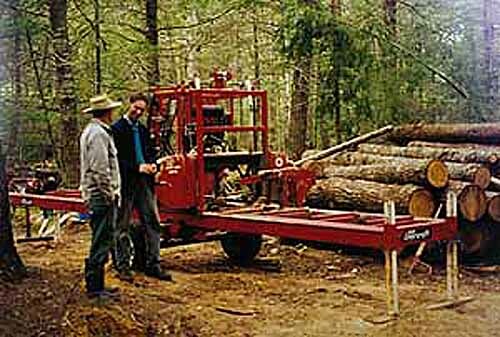 It was founded in 1969, and is the oldest independent woodlot owners and operators group in the province. It was “never a favorite of the Department of Lands and Forests”. An initiative of NSWOOA. “The Nova Scotia Woodlot Owners and Operators Association is hosting a unique project called The Forestry Lab to address challenges in Nova Scotia’s forestry sector. See Event Summaries for a sense of what it is about. “The Nova Scotia Woodland Owner of the Year Award (WOYA) recognizes and rewards landowners for outstanding stewardship of their woodlands. It was developed to encourage woodlot owners to practice sustainable woodlot management and to increase public awareness of the importance of private woodlots in Nova Scotia and good woodlot management.” Descriptions of woodlot operations by winners of this award going back to 1999 make some pretty interesting reading. “An environmental start-up, working to connect people and their communities to the forests that sustain them.” Highly innovative, Maritime based. Six case studies are described in detail. GPI Atlantic.